Apple’s new Fusion Drive is pretty nifty. It sets out to give users the capacity of a hard drive along with the speed of a solid-state drive. Fusion Drive works as advertised for what most of us do, most of the time. As seen in our Speedmark 8 performance tests of a BTO Mac mini, the Fusion Drive, made up of a 120GB SSD and 1TB hard drive, was on par with standard SSD speeds in photo imports, file duplication, and unzipping of files. But what happens when you push the limits of the Fusion Drive? 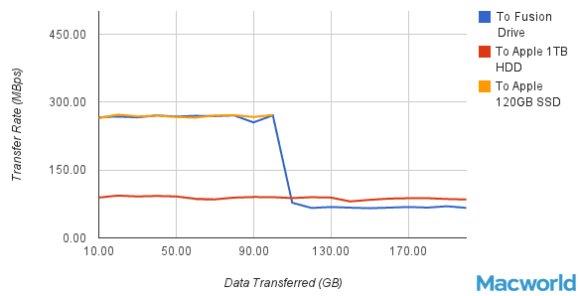 To find out, we set up a test that copied twenty 10GB files, one at a time. We tracked the time it took to move each file from internal storage to external storage, and from the external back to the internal. We copied files and tracked the speed until the copied completed, or in the case of the SSD, until it reached full capacity. We then ran a similar test with twenty 10GB folders, each containing 7421 individual files. We used a Promise Pegasus six-drive RAID 5 as our external drive, connected via Thunderbolt to a 2.3GHz quad-core Core i7 Mac mini with a Fusion Drive. We ran the tests using the Fusion Drive, and then we separated the 120GB SSD and the 1TB 5400-rpm hard drive that comprise the Fusion Drive and ran the tests on those drives individually. What we found was that the Fusion Drive kept up with the SSD in these sustained tests—right until the SSD portion filled up. Copying the files from the Fusion Drive to the Pegasus cooked along around 470 MBps until approximately 100GB worth of files had been copied, at which point the speed dropped down to about 80 MBps. 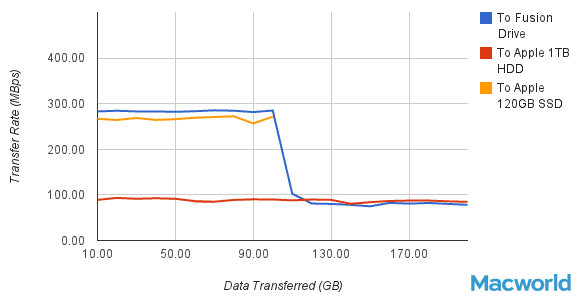 When we changed the configuration to test copying files from the SSD to the Pegasus, we also saw speeds of 470 MBps, but the test stopped once 100GB of data copied, hitting the SSD’s capacity limits. The 1TB hard drive started out at around 90 MBps and remained consistent, finishing the test at a little more than 83 MBps. Macworld Lab testing by James Galbraith and Albert Filice. Copying the files in the opposite direction—from the Pegasus to the Fusion Drive, or SSD, or hard drive—showed a similar (though slower, overall) pattern. The Fusion Drive started out at 284 MBps and then dropped to about 80 MBps after the threshold of 100GB of data copied was crossed. 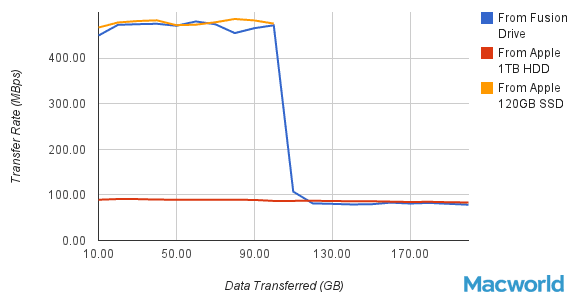 That was a bit faster than the 120GB SSD, which averaged around 270 MBps until it filled up. The 1TB hard drive performed almost identically to its read times, about 90 MBps, slowing a bit to 85 MBps as the test approached 200GB of data copied. Our folder copy tests showed a similar pattern. 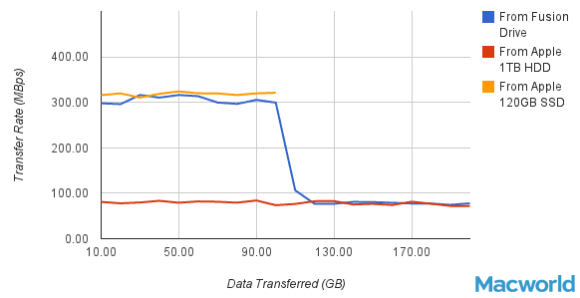 The Fusion Drive wrote data from the Pegasus at around 270 MBps and dropped to 70 MBps. The SSD held steady at 270 MBps until full, and the 1TB hard drive started at 90 MBps and gradually slowed until leveling off at 84 MBps. Copying data to the Pegasus was faster for the Fusion Drive and SSD—300 MBps and 320 MBps, respectively—though the Fusion Drive slowed to 78 MBps after 100GB of data had been copied. The hard drive read at 80 MBps, slowing to 72 MBps towards the finish. Most people don’t spend their days copying 100GB worth of files back and forth, so we ran Speedmark 8 again on the BTO Mac mini, but this time we loaded the hard drive with nearly 600GB of files and folders, way beyond the capacity of the SSD portion of the Fusion Drive. The Fusion Drive slowed down a bit compared to our standard Speedmark test setup, which generally takes up about 90GB of disk space. But the half-full Fusion Drive was still considerably faster than the same system tested with the standard-configuration 1TB 5400-rpm hard drive. Copying a 6GB folder took 42 seconds on the Fusion Drive; it took 43 seconds on the half full Fusion Drive, and 138 seconds on the hard drive. Importing pictures into iPhoto took a couple of extra seconds on the half-full Fusion Drive, but was still nearly twice as fast as the hard drive in the same test. Speedmark 8 results are scores; higher scores are better. Duplicate and Uncompress test results are times in seconds; lower is better. Best result in bold. Results are times in seconds; lower is better. Best result in bold. iMovie results are times in seconds; lower is better. VMware PCMark results are scores; higher is better. Best result in bold. The Fusion Drive sets a certain amount of SSD capacity aside, at least 4GB. All data is written first to the SSD, but if you’re moving very large amounts of data in a single work session that exceeds the capacity of the SSD’s reserved area, the Fusion Drive has to move the data to the hard drive. If you’re trying to move a lot more than the SSD can hold, you will eventually hit a hard drive bottleneck, where the Fusion Drive has to slow down to the speed of the 5400-rpm hard drive. A Fusion Drive is not able to transfer a full 1TB of data at SSD speeds, because it does not have a 1TB SSD. As seen in our Speedmark tests, however, smaller (but not small) transfers of data are handled well by this SSD-first strategy of the Fusion Drive. Most jobs are completed with speeds much closer to SSD speeds. Check back soon for more Fusion Drive coverage once the new iMacs start shipping.